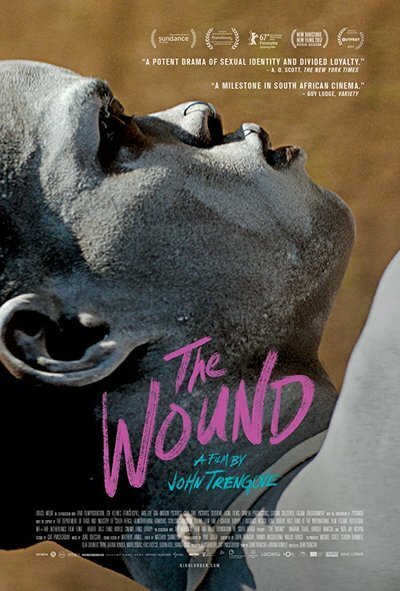 “The Wound” is set in a remote rural community in South Africa, and is centered on a cultural ritual that will no doubt strike most outsiders as being barbaric. At the same time, however, it is also a film that deals with issues of masculinity, sexuality and community that will strike universal chords with viewers of all stripes, regardless of where they are from or where their beliefs may lie. The result is a dark and stirring variation on the standard coming-of-age narrative that, much like its central characters, does not follow the path one might expect. Having undergone the ritual himself when he was a teenager, Xolani (Nakhane Toure), now a lonely warehouse worker in his mid-30s, returns every year to serve as one of the “caregivers” to one of the new boys, but his interest in the ritual is halfhearted at best. No, what brings him back is the opportunity to, however briefly, reestablish his sexual relationship with childhood friend and fellow caregiver Vija (Bongile Mantsai). Although Xolani dreams of the two of them running off together, Vija, who has a wife and family in town and projects a hyper-masculine pose to everyone, clearly does not feel the same way. It is clear that Vija regards him as a convenient tool for gratification and nothing more. Xolani’s charge this year is Kwanda (Niza Jay Ncoyini), a young man who lives in Johannesburg with his mother, who has been brought there by his father, a tribesman made good, who fears that his son is “too soft.” Far more sophisticated than the other boys undergoing the ritual, Kwanda alienates his peers and elders alike with his diffident attitude and his piercing questions about why the Ukwaluka rite even exists at all. It doesn’t take Xolani too long to figure out that, in addition to everything else, Kwanda is also gay, just about the biggest no-no of all in this particular community. What makes this even trickier is that Kwanda not only realizes that Xolani is gay as well but has a fairly good idea of the true nature of his relationship with Vija. Before long, tensions begin to rise between the three with Xolani and Vija beginning to crack under the pressure of trying to be something that they aren’t and Kwanda, for all of his smarts, not realizing how much danger he is now in. At first glance, a film like “The Wound” might seem fairly alien from a cultural standpoint to a lot of viewers—the mass circumcision sequence seen (and especially heard) in the early going will almost certainly horrify the majority of them in ways that infinitely more graphic scenes of carnage in conventional scare films could not even begin to approximate. As the film goes on, however, it begins to capture and examine in intriguing ways any number of universally held truths and fears, such as the shame one oftentimes feels as they force themselves to live a lie, and the sense of rage that those same people feel at those who have managed to stay true to themselves. As a result, a story that might have played out as an ordinary coming-of-age scenario is given a darker and more dramatic spin that leads the story into unexpected areas before arriving at a finale that is legitimately surprising while still coming across as the plausible end result of the events we have seen. The screenplay, which was co-written by John Trengrove (also making his directorial debut), Thando Mgqolozana and Malusi Bengu, does have a couple of moments in which it hits the dramatic points that it wants to make just a little too hard—at one point, Kwanda tears into Xolani with “You want me to stand up and be a man but you can’t do it yourself” and later wonders “How can love destroy a nation?” However, those moments are few and far between, and, for the most part, it takes an intelligent look at the subject at hand without degenerating into pleas for tolerance straight out of the Screenwriters 101 handbook. Trengrove’s direction is strong and sure in the way that he captures both the rhythms of the Xhosa and the ways in which their increasingly outmoded ideas are crumbling all around them and he elicits powerful performances from his three lead actors as well. A film befitting its title, “The Wound” is a rough and unsparing film that offers an unflinching look of how once-traditional notions of masculinity can grow increasingly toxic in the hands of those who cling to those outmoded ways rather than accept that things have changed. It is not a film with easy answers to the problems that it depicts and there are moments that may simply be too painful for some viewers to endure. However, those who are in the mood for something more challenging than the usual multiplex fare or even the typical art house offerings are likely to find it to be an ultimately rewarding experience.